The seventh chakra represents God realization in the mind of the soul. This is why the crown center is placed at the top of the head - the house of the mind. It represents the highest spiritual thoughts that the mind can have - namely that of God Realization. It represents the spiritual enlightenment of the mind. The mind - as an instrument of the soul - realizes that God exists. "Aha! ", thinks the mind, "God Exists." Then there is peace of mind (yogas citta vritti nirodha) and the mind can function naturally and purely as it is supposed to do. Then the soul - whose embodied home is in the heart center - realizes itself to be at one with God in the heart center. It is not enough to simply realize God with the mind. The realization, by the soul, of God in the heart is the ultimate goal. It is very important for the soul to realizes itself to be in the heart center with God and God's love as this prevents further, and unnecessary, intellectual speculation concerning God and soul. Soul's that lack humility at this point tend to continue with unnecessary spiritual speculation, unnecessary theology, and "overly complicated spiritual systems." These trappings are unnecessary to the soul that has realized itself to be at one with God in the heart center. This is also the important message behind the priest's hooked staff, which shows that the realization of God with the mind is not the end of the journey. The staff has a lantern attached to it which is held at the level of the heart center. In humanity's whole history of thought, study, communication and experience do we consider that LIFE - EXISTENCE - GOD may be a complete mystery, even unto Itself? Perhaps. One thing seems certain, it is God that is the whole show and it is God that experiences all life. I feel that the seventh chakra (crown/sahasrara) is a representation of our inability to intellectually capture the most elusive and mysterious Being that is God. Therefore the attributes of the seventh chakra might be the experience of ultimate mystery, wonder, mystery, humility, acceptance (of God and Life), and the deep peace of surrender to God's mystery. God exists! God is the ultimate mystery and is beyond our intellectual understanding. Accept this, and learn the lesson of the Crown center - surrender to the ultimate mystery that is God. The “thousand petals” attributed to the crown chakra is a way that teachers tried to convey the infinite mystery that is God and The Creation. Uncountable, massive, infinite, beyond our comprehension. The lesson of the Sahasrara is that you cannot fully realize God by reason and intellect alone. Go down Moses! Oh Soul, Go and join your Maker in your heart. Accept yourself as a soul and the Creation as God has made it all. "The end of the need to know more concerning spiritual speculations." "The aim of Yoga is the intentional stopping of the spontaneous fluctuations of consciousness (so the Yogin may realize God)." End of speculative thinking. The end of atheism. The end of non-spiritual thinking and experience. Humility (in the realization of God). The end of the desire to over-intellectualize about the nature of God, Soul, and the Creation. 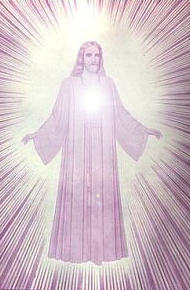 The realization that God exists and that the soul and God live in the heart center. The end of the need to over-intellectualize about God, and thus the entry into the ultimate mystery that is God. The soul experiences a quietening of the mundane and fluctuating mind, and in this peace they can consider and realize God, and realize the ultimate mystery that is God. This is surrender to the ultimate mystery that is God. No human can know the totality and mystery that is God, we can only consider, be aware and love our Creator. "We cannot approach God by intellect and reason alone. God's ultimate nature is a mystery and we need only thank and love God for creating us and such a beautiful Creation. We need to approach God from the heart with love, respect, and reverence for His Being - for His existence from whence all things arise." God is all qualities in the Creation. God is the Ocean from whence all experiences of variety and multiplicity arise. Realize the eternal fullness of the Ocean, and the nature of the Creation (and all possible Creations) as a tiny ripple in the Ocean of fullness and bliss that is God. Realize the Creation and all possible Creations, to be a mere ripple in the infinite, eternal, fullness, mystery, and Oneness that is God. There is but One life, and that is God, and its manifestations comprise all the forms and shapes of the Universe. From God comes Life - and Life can come only from God. Our limited mind with its human logic, mental capacity, speculation, and imagination is awed by realizing the eternal and infinite variety and ultimate mystery that is THE REALITY OF GOD. Many enlightened saints and sages inform us that God and the Soul abide in everybody’s heart chakra and are having a great time. The soul is tiny and fully dependent upon God. God is the Divine mother and Father of all Creation. Having realized that we cannot “know” God with our mental speculations and even our wildest imaginations (God defies our logic and no human mind can capture God’s mystery) then we have realized the crown chakra as "God exists", mystery, wonder, awe, humility, peace, and reverence. This realisation brings complete peace of mind and at the same time we accept ourselves as human beings – as God has made us (explained by the seven chakra system) – and return to center ourselves in the heart chakra – where God is waiting for us with a loving embrace and a knowing smile. The “thousand petals” attributed to the crown chakra is a way that teachers tried to convey the infinite mystery that is God and The Creation. Uncountable, massive, infinite, beyond our comprehension. The lesson of the Sahasrara is that you cannot fully realize God by reason and intellect alone. Go down Moses! Oh Soul, Go and join your Maker in your heart. Accept yourself and the Creation as God has made it all. ...there is one last part of the journey to complete our integration with God. This is the act of surrender to God (Isvarapranidhanam means "surrender to the ultimate mystery that is God"). This is the last chapter in the soul's journey out of the darkness of spiritual ignorance, and the final act of giving up the ego and avidya (spiritual ignorance). When the time is right, we all eventually surrender to God. "God, it is all your show. I surrender to you. We are all cells in your universal body of life - created characters in your play. It is all Thine." This can only be done by you.